Are you looking for pubs in Derby with a wide selection of drinks and a warm and welcoming atmosphere? Then the Lodge Bar & Dining at Littleover Lodge is the perfect place for you! Situated in the charming village of Littleover close to the beautiful Derby countryside, the Lodge Bar & Dining is the perfect place for stopping off for a drink after a day of exploring or for a much-needed catch up with friends and family. You are assured a warm welcome by Nick and his team when visiting our pubs in Derby and we’re certain that you’ll instantly feel at home! From beers and ciders to spirits, cocktails, wines and non-alcoholic drinks, we have something for everyone at our pubs in Derby! 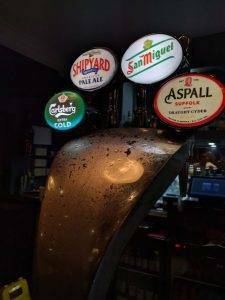 In addition to our fantastic drinks range we also home to a fantastic a 50 inch screen showing Sky Sports so if there’s a big game on any time soon, you’re more than welcome to join us and support your favourite team! The atmosphere is always friendly and you’re guaranteed a great evening! The Lodge Bar & Dining is also home to our hugely popular traditional, home cooked carvery which is served daily. With delicious award-winning meats, golden roast potatoes, rich gravy and fresh local vegetables you’re guaranteed to fall in love – and that’s before we’ve mentioned our yummy Yorkshire puddings! If a carvery isn’t quite to your taste, we also serve freshly produced gastro menu at our pubs in Derby… We are also home to one of the leading pizza restaurants in Derby! Freshly prepared food is served lunchtimes Monday to Thursday from 12 midday until 2.00pm and we open again in the evenings at 6.30pm til 9.00pm. On Fridays, Saturdays and Sundays however we are open all day, serving food from 12.00pm – 9.00pm – So why not pop in for a visit to try some our home made food for yourself to find out exactly why we’re one of the most popular pubs in Derby! We’d be happy to have you! If you really want to treat yourself, try some delicious drinks from one of the leading cocktail bars in Derby – The Lodge Bar & Dining! Want to Know More About Our Pub in Derby? The Lodge Bar & Dining is a family friendly pub in Derby and we regularly have live music events and special offers to make your stay with us truly enjoyable. As one of the leading pubs in Derby you are guaranteed the warmest of welcomes and we’re sure you’ll be visiting us time and again. If you have any questions or queries, then please do not hesitate to get in touch! A member of our team will be more than happy to help!